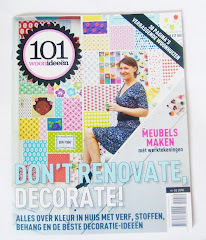 Blij als mij: 102nd Post Give Away! For weeks I was counting my posts...wondering when I would reach the 100 and what to give away to celebrate... How could I not see that I was writing my 100st when posting ' CUTE '!?!? Anyway...let's celebrate it with a 102nd post! Leave a comment on this post before saturday and I'll pick a winner this weekend and let you know. 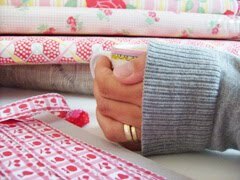 The winner will receive a little handmade item and some red and white fabric from my stash. Don't be shy! Even if you never commented before please leave a comment! I'm so curious about who you are (and I don't bite LOL)! Congratulations on 102 posts! Would love to be included in your give away. Well congrats on your 100th (101st and 102nd) posts! Congratulations. I would love to receive a mystery package in the mail. Please include me in your give away. Gefeliciteerd met de 102e!! Ik geniet iedere keer van je creativiteit en de vrolijke kleuren: it lightens up my day! Gefeliciteerd. Ik lees je blog met zeer veel plezier. Ga waarschijnlijk ook de strokenrok uit de Ottobre maken, vond die van jou zo mooi! Zondag vieren we de verjaardag van Pelle, dan krijgt hij de speelzakjes. Daar heeft hij vast veel plezier mee. You don't bite? :-( (tricking!) Congratulations on 102 posts. I've only just discovered your blog and I love the things you make... keep up the good work! Ben super trots op je. Hele dikke kus van je vriendinnetje. gefeliciteerd! ik ben redelijk verslingerd geraakt aan het bloggen, maar 102 posts haal ik nog lang niet! erg mooi wat je allemaal maakt, vooral ook zo mooi afgewerkt. Congrats on your first 100 (102) posts. I love your blog. Count me in the draw please. Congrats from me. I love surprises so throw my name in the hat, please. Congratulations for 102 posts! Your blog is really sweet, very inspiring and always a pleasure to read. Cheers from Australia. Hi Erna, What a lovely pincushion. Congratulations on your 100th and your 102nd post. Congrats on 102 posts that is really great. time sure goes by fast. if you will post to canada count me in...thanks!!!! Congratulations on 102 posts Erna! I always love reading your cheerful posts and seeing all your red/white goodies. Congratulations on 102 posts. I enjoy reading your blog. You do such beautiful work - I love all your red items that you craft, gorgeous! Congrats on 102 posts!!! Please count me in for your giveaway. You have such a beautiful blog and your creations are amazing. congrats on 102!!! I too just missed my 100th post, funny that. Love the red pin cushion and your label.. I'm one of the shy ones. I love your blog and enjoy reading it. I also think the things you create are wonderful. I hope you continue to blog for years to come. Congrats! Hi Erna, well done on 102 posts. I have a long way to go before I reach that milestone!!! I love the red and white pin cushion. Your colours are lovely together! Hi Erna, Gefelciteerd met de 102 berichtjes! Gaat snel, hè? Op naar de 200! Zou ik zo'n leuk speldenkussen kunnen winnen ipv zelf maken? Zou leuk zijn! Congratulations on your 102nd post! You make lovely things! Happy 102nd Post! Time flies when you are having fun! Veel succes nog en ik zal met veel plezier mee blijven lezen!! Hello! from New York City. I love the red, white, and polka dots! Hopefully I will make enough progress on my red and white quilt to post pictures soon. Gefeliciteerd! Dat er nog honderden zullen volgen! Je zit in mijn Bloglines, dus ik volg je trouw. Erna, congratulations! I'm checking your blog almost every day and enjoy to read your your posts! It's just like you're visiting me for tea, telling me your stories about your life and craft. I hope to read your post for years and years and wish you a very nice and warm summer holiday with a lot of happy moments when you execute your 'to do list!". This is my first comment on your blog. I love your ideas and fabric choices. All are so fresh and beautiful. I look forward to reading your new posts, so I hope that you continue on with your blog for many years. 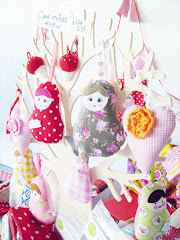 Hi - I came to your blog via "madebyrae" -- like your blog - will visit again -- would love to win your 102nd post give away - red and white goodness. Congratulations. I LOVE the cauliflower harvesting shot of your boys! Like the turnip story, a favorite of Sylvan's. I'm so happy to keep reading about and looking at your wonderful work. Enjoy your summer---it's all too brief. COngratulations on the 100th, 101st and 102nd posts :) Please, please, count me in. I've been a good girl and adore your creations! Wow, alweer 102 entries. Je werk blijf geweldig, iedereen vraagt waar ik die geweldige babyschoentjes heb gekocht. Gefeliciteerd! Geweldig! Je blog is geweldig en je creaties helemaal.. I've been lurking on your blog for ages and only realised this week that the link to your blog from mine didnt work! Its all rectified now though. Happy 102nd post amd happy anniversary for your other post.